Description: This is a project created using photoshop to mask and blend images into one cohesive message. Process (Programs, Tools, Skills, Steps taken while designing): I pulled photos off the internet from unsplash.com, Pinterest, and Google search and brought each of them into Photoshop. I started with the starry sky as my background, and I tried masking in two different landscapes, but this one had a better angle and more detail. I changed the lightness and saturation of the landscape so it would blend better into a night scene. I used the overlay setting in Photoshop to create a double exposure of the girl and a sunrise/sunset sky background. I masked her into the scene and then I masked in the picture of Jesus Christ and blended him into the sky with the brush tool. In the original photo he was holding someone’s hand, so I found another picture of the Savior’s hand outstretched and masked/blended that in place of the original. I played with the typography, trying different fonts and locations, but I decided to stay simple and leave more “whitespace” in the sky rather than the ground. Message: I really wanted to communicate the divinity of the human soul and the divine potential we have to become like our Savior Jesus Christ and God the Father. I wanted to communicate the light from within the girl and connect her to the lights in the heavens as symbolism of her exalted destiny. 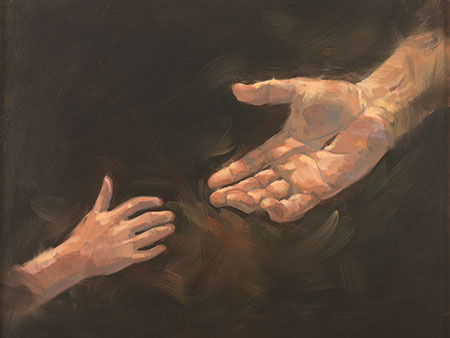 This is possible through Jesus Christ, and so it is Him inviting her to take His hand and reach her potential. Audience: The design elements were chosen for a young adult audience. Top Thing Learned: I learned a lot about masking and blending images. I was challenged to really showcase this skill, and adding the picture of the Savior post-critique was a risk and a benefit to me to fulfill the requirements of this project. Filter / Colorization used and where it was applied: I turned down the lightness and saturation of the landscape (using the Hue/Saturation filter) so it would blend better into a night scene. I also used the overlay setting in Photoshop to create a double exposure of the girl and a sunrise/sunset sky background. Description: This is a photodesign project using photoshop to create a layout featuring my own photography and practicing my typography and color scheme skills. Process (Programs, Tools, Skills, FOCUS principles): I used a Nikon camera to take the photo, then used Photoshop to edit and enhance the photo. I started my first draft as a full-bleed of the photo and the quote aligned down the right side, but that was hard to read and felt crowded. Then during my critiques we thought it would be effective to change the layout to a landscape so I would have more space for design elements. That helped the flow and rhythm and balance between the photo and the quote. I tried to add the flowers and leaves as repetition from the photo. It was hardest to balance color values for this color scheme. Message: I wanted to communicate the natural beauty and connection we have with people, regardless of what they own in possessions, because that is something I associate with the subject of my photo, who is a close personal friend. Audience: My audience would be a youthful, young adult audience who may relate to the message of my design. Color scheme and color names: I used a split complementary color scheme of violet, green, and yellow. Date and location you took the photo(s): Photo was taken Tues. May 17, 2015 in Rexburg outside of the Presbyterian church on College Ave.
As a child, I grew up next-door to Katie, playing dress-up and telling stories. In high school, Katie’s family moved, which was sad for us, but both of us were glad that she would still attend the same school. Moving 10 minutes away, however, changed Katie’s life forever. There in the rural outskirts of town, she met Jacob. Jacob was a year ahead in school, and wasn’t connected with the same circles as Katie, which meant they never had reason to know each other previously. As neighbors though, he noticed her quickly, and made an effort to ask her out on dates. Jacob graduated and served voluntarily as a missionary for the Church of Jesus Christ of Latter-day Saints. The pair wrote each other diligently for two years and each kept a stack of letters from the other. Now, four years later from first meeting each other, and all grown up now, Katie and Jacob have decided to spend the rest of their lives together. They were married in Provo, Utah on April 21, 2016. She was a beautiful bride, glowing in her mother’s white bridal gown. I felt so happ y and privileged to help make their day possible, even in the smallest of ways, by setting up the reception. One of the highlights for me as an amateur wedding planner was unboxing the decorations and feeling like I was unboxing a little of Katie’s personality. Katie is a horticulture major, and has always loved plants. She chose to highlight that passion in her reception décor with ferns, pinecones, acorns, tree cookies, and white lilacs. Katie has also always been a reader and loved to write, so choosing the event room at the local library was a perfect choice in venue. As we set up the trees, birch arch, photos and centerpieces, I was overwhelmed by how lovely it all was – and it was because I knew it was Katie’s wedding. Not her mother’s. Not her aunt’s. Hers. This is an essential principle that every bride needs to understand, accept and embrace as they plan their wedding. Your wedding should reflect who you are as a couple. There is an endless sea of wedding inspiration on Pinterest, blogs, and bridal magazines and with so many ideas, it can be really hard to define what you want your wedding to look like. Julianne Hough, famous for her roles as a professional dancer and actress also writes a personal blog, and she also expressed the overwhelming decision she faced even before getting engaged about what style she wanted to express on her wedding day. She used a mood board to define each of these styles, a method that many brides can benefit from. (This is the site she refers to for more information about mood boards) See her blog post here. But it’s not only about deciding who you want to portray or what style of dress you want to wear. It’s about bringing in the little details that make a day special. Repetition of small details can be what completes an experience. Why do you think Disney Theme Parks use “hidden” (aka “subliminal”) Mickeys? Your venue – whether it’s a sentimental location to you as a couple (the place of your first date, etc.) or if the event itself can reflect the setting and culture of another place important to you, places mean a lot and can hold a lot of sentimental value that typify you as a person and as a couple. Include hobbies, careers and passions that each of you have. Whether you’re sports fanatics or book worms, there are ways to incorporate the things that are important in your everyday life. Themes and details from a favorite book, television show, or movie can add personality to your wedding that will make your guests smile knowingly. “Pick wedding traditions that are unique to your and your partner’s cultures and history, and ditch traditions you don’t feel connected to.” If you don’t want to stand in a receiving line, don’t! If it’s important to wear another color besides white in your cultural heritage, don’t be afraid to wear something bold. Be creative and true to yourselves. Ask your friends what they did to personalize their weddings and take note when you attend weddings about what from their personalities they were able to communicate through the details. I know I took note when I helped with Katie’s reception. It can be so motivating and inspiring to plan a wedding when it includes things you love personally for yourself, your fiancée, or your family. Design it for you, not social obligations. Looking back on that special day now, Katie is so glad that she did her best to not stress about tradition and people’s expectations. The most important thing for her was to be surrounded by what she loved most in this world. In the end, it’s not about what others say, this day should be about love; that applies to the design of the event, who is chosen to be there, and the couple. A wedding is not just a hallmark for the extended family, but as a couple promises to love each other forever, a new family is created. This is greater than any social traditions or expectations. Thanks for dropping in to read my blog! Please comment, like, share, and subscribe! Happy Wedding Planning! My first response to this photography activity was relative confidence about my abilities. Starting out, however, it became apparent that it wouldn’t be as easy as I was expecting. My first images were mediocre, and I was struggling to find the right angles. What really helped was asking my friend to come with me and model and be a second creative eye. As we explored our neighborhood and further into town, we both were able to see things the other wasn’t able to, so we were able to spot the best scenes and angles. We were told to take six images, but it becomes clearly apparent as you’re taking photos that taking lots and lots of photos from different angles helps to capture the perfect shot. Plus, it’s such a fun activity, how could you only take six photos? Description: This is a charity event advertisement for a fictional wedding dress trunk show. I chose my favorite designer, Hayley Paige, and a cause I care about, Susan G. Komen For the Cure, to idealize an event that would make a difference in many people’s lives. Brides could come to this event and get one-on-one consultations with Ms. Paige and try on her designs, as well as donate to benefit breast cancer awareness, prevention, and research. Process (Programs, Tools, Skills, FOCUS principles): The challenge of this project was to only use Microsoft Word and scanned images. I started by finding and scanning my image (the Hayley Paige gown) found in Brides magazine, as well as the Hayley Paige signature. I inserted the gown image into Word, as well as the cropped signature. I used the “remove background tool” on the signature so the two images would blend together. I couldn’t find a Susan G. Komen brand image print to scan, so I made that from scratch by studying and searching the internet for a similar sans serif font and I created the pink ribbon with shapes built into Word. I did the most changes after my critiques on the bottom third with the event information. I changed it from two columns of information/date, time, place, to the information being justified across the page and the date, time, place split into thirds across the bottom. Message: I tried to communicate the dual beneficiaries through color and type. Pink is the branded color for breast cancer, and I took advantage of that with a Hayley Paige blush-colored wedding dress. I hope that the purpose of it being a bridal trunk show for the purpose of charity is communicated through the text. Audience: My audience would be brides, especially those close to someone who has experienced breast cancer, or empathizes in another way with the charity. Color scheme and color names: I chose to stick with a monochromatic pink color scheme to stay true to the breast cancer awareness brand. It’s a lighter shade than normal, but I chose to do that to play off the blush bridal gown. Top Thing Learned: I learned to leave negative space around my text, and that alignment really matters. Customized alignment is not easy in Word, but it turned out to be the most important thing I worked on. Scanned images used, sources, original sizes, location of scanner used: I scanned the gown photo and the Hayley Paige signature from the June/July 2016 edition of Brides magazine. The original is 8×11 inches. I scanned from a home Epson scanner. Description: A promotional flier for a leadership conference for graduating students. Process (Programs, Tools, Skills, FOCUS principles): I started with pencil to paper, sketching different layout ideas. I decided on one that was simple and utilized both contrast and whitespace. I brought the idea to Adobe InDesign, which, while new to me, went fairly painless because of the simplicity of my design. When I completed my first draft, two friends gave me similar feedback, that perhaps my hierarchy could be improved. That’s when I went back to InDesign and shifted the elements on the page. I brought the title to the top, rather than under the black banner, made the photo, banner, and logo smaller, and put more emphasis into making the body more legible and clear in communicating the purpose of the conference. This resulted in a design that utilizes white space, contrast, alignment, and a clear hierarchy. Message: The message is meant to indicate that this conference will be an opportunity to learn and develop leadership skills that will benefit graduating students as they seek positions in the business world. Audience: Graduating students ages 22-30. Top Thing Learned: I learned about hierarchy, and what was most important to communicate.